When you become so tired after enjoying so much fun during your vacation in Branson, it’s time for you to relax in a cozy log cabin at Thousand Hills Golf Resort at the Grand Mountain. 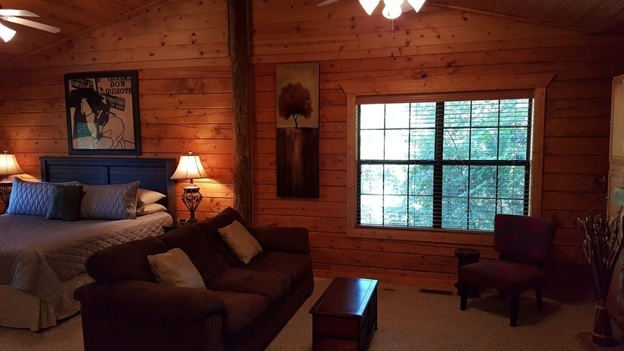 Branson log cabin is a perfect accommodation for travelers coming to Branson who want to experience the relaxing atmosphere in a secluded place. The wonderful vacation experience that you want to enjoy is waiting right here in the Ozarks – see the beauty of nature, unspoiled scenery, the clean and crystal clear waters of the pristine lakes, bountiful wildlife, and countless exciting activities and thrilling water adventures. Branson log cabin is beautifully designed with the inspiration of beautiful natural setting and magnificent landscape around the Ozark mountains. This cozy log cabin accommodation at the Grand Mountain allows you to enjoy convenience, luxury and comfort that can’t easily be enjoyed in a regular hotel accommodation. Log cabins are some of the most preferred accommodations by guests for any vacation all throughout the season. Thousand Hills offers you a unique opportunity to stay in a rustic natural setting with luxury and comfort yet affordable and with easy accessibility into the heart of entertainment district of Branson. When you stay at the beautiful log cabin at the Grand Mountain, you can have the opportunity to play golf at the nearby Thousand Hills Golf Course, home of the award-winning 18-hole golf course in Branson. Whether you’re a novice golf player or professional, you’re rest assured that the traditional respect and hospitality of the Ozarks are fully enjoyed. The accessibility of the log cabins at the Grand Mountain from exciting attractions is one of the reasons why many guests want to stay in this beautiful accommodation. The beautiful location of Thousand Hills lodging project in Branson offers an intimate escapade for couples who want to experience a wonderful vacation in a tranquil environment. Beautifully nestled in a wooded place in central Branson, the cozy log cabins at Grand Mountain are available in a variety of styles and sizes. Some cabins feature romantic setting for intimate couples, to two-bedroom and three-bedroom cabins that sleep up to eight guests. All of these cabins feature a living room, a sofa sleeper to make extra guest feel comfortable, dining room, and private front or back porch. These cabins all feature fully equipped kitchen that include modern appliances such as fridge, microwave oven, washer/dryer, dishwasher, pots and pans, and kitchen wares and utensils. The log cabins at Grand Mountain are perfect for homesteaders and vacationers but they’re becoming a favorite choice for businessmen looking to invest on the booming tourism market. Whether you’re looking for a home to live or as a vacation getaway, log cabin accommodation is a great place to consider if you’re on the hunt for a luxury accommodation. So, if want to take a wonderful vacation in Branson, choose the cozy log cabin at the Grand Mountain where you can experience a relaxing getaway with the whole family.